“From the song Respect written for the Mother Leopard. I remember like it was yesterday. I had rigged surveillance cameras in Shadow’s den and together with my two boys Sean and Tao we waited for Shadow to give birth. Through the den, I had made some strategic holes so I could stay outside the den, but filmed the action on the inside. The first birth I missed, because Shadow was lying facing away from me. The second cub was Corbett who immediately waddled out of the den. The third cub born was Panna and Shadow gave birth standing up. Immediately after Panna was born, Shadow sat down on top of the cub. As I am filming I shout into the camera “you are crushing the cub, you are crushing the cub!” That tiny cub was Panna. Fortunately, the embryonic sack was extremely slippery and Panna shot out from under Shadow like a piece of soap. Later when looking at the footage, I noticed that Panna’s tiny claws were extended and it these claws that cut the embryonic sack wide open. In short, Nature had taken care of everything. Later Sunette Fourie put the birth on YouTube and today over 8 million people have seen Panna’s birth. For several months, I couldn’t find Shadow and the three cubs (One cub died after Shadow sat on it). Only after six months did we start to see and photograph the three cubs. It became apparent that the two cubs, Panna and Sariska were exceedingly shy and one cub Corbett was bold and aggressive. Between 20 and 30 months, all three cubs dispersed from Shadow. Corbett and Sariska both captured territories, but Panna was unable to do so. Firstly, Panna was a small tigress, but she also lacked the aggression needed to fight for a territory. Shadow, Panna’s mother attacked her, as did a female called Indira who was bigger and stronger than Panna. Several times I called a Vet to stitch Panna up after she had come off second best in a fight. In the floods of 2011, four hundred meters of the fence was destroyed. Corbett immediately swam out of the park into the neighbouring farm land. Panna remained inside Tiger Canyons even though the fence was gone. When we extended the tiger home range at Tiger Canyons, I immediately darted Panna and moved her into the new area. Panna moved into the north-west corner of Tiger Canyons and set up her own territory. Previously when under pressure, Panna had not come into estrus regularly. Now with her own territory she was cycling regularly. 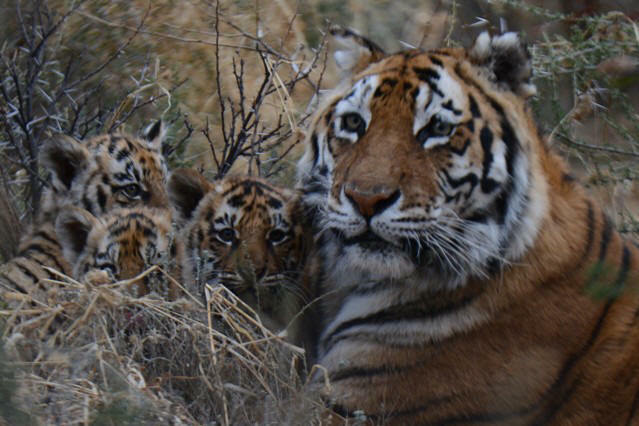 With the advent of the cubs, Panna has become the main attraction at Tiger Canyons and she has responded magnificently. Over the last 3 months I have developed a communication system with Panna which is extraordinary. Shadow’s favourite den site is a rocky outcrop on top of a hill. This den site is totally out of sight of cameras and lenses. I stand at the bottom of the hill and I give two different calls. The first call is a roar and this means that I want to help Panna with a dead warthog. The dead warthog is placed in a warthog burrow and Panna comes to the burrow and removes the warthog and takes it back to the cubs who are waiting in the den and out of sight on top of the hill. The second call I give is “Staccato Chuffing.” This call is requesting her to bring the cubs so we can view and photograph them. For doing this, there is no reward of food. Eight times I have requested this favour from Panna and five times she has brought the cubs for viewing. The viewing time is normally short, 10 to 15 minutes and then she returns to the den and out of sight. This is not the first time I have established this mutually rewarding relationship. The original mother leopard at Londolozi did it often, Manana did it once or twice, Tigress Julie did it regularly. People have asked me to interpret the symbolic behaviour and I believe that Tigress Panna has an instinctive idea that her safety and wellbeing and those of her cubs are tied to human beings. 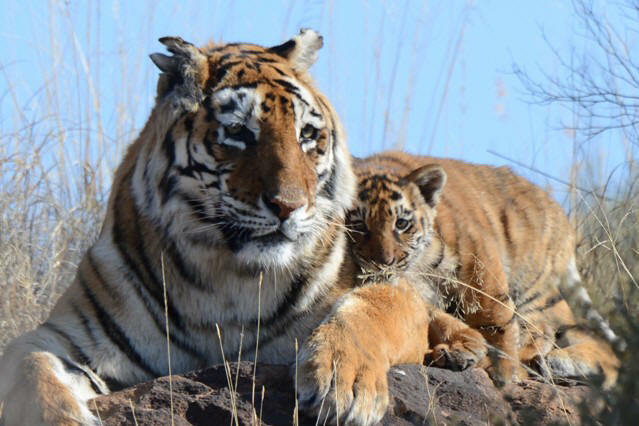 Tigress Panna has made a conscious or unconscious decision to share her cubs with us. In a very simple form, “you give me food, I give you photographs". For me the Tigress Panna relationship is especially rewarding. Panna is not a Tigress I know well. I have perhaps spent less time with her than any other Tigress. I have been inspired by the Mother Leopard, Shingalana, Manana, Tigress Julie, Tigress Tibo and others. However, the relationship with Panna is extremely special. The arrival of her cubs has changed everything. A symbiotic relationship has blossomed. The shy Tigress is gone and in her place a confident caring sharing mother, totally relaxed in our company has emerged. Panna nearly perished at birth. She was brutally attacked by Indira and Shadow. She remained without cubs for eight long years. Tigress Panna has outlived her two brothers, Sariska and Corbett. She has turned her life around and what a pleasure and privilege it has been to be part of the journey. Panna’s litter of cubs have revealed that in fact Tiger Canyons now has 4 different types of Tigers. The first type is a normal tiger which possesses two normal genes. The second Tiger is a White Tiger which possesses the gene SLc45a2.This gene is valuable and has been around in the wild since the 13th century. This gene should be conserved at all costs. Tigress Tibo possesses 2 white gene or 2 by SLc45a2 genes. 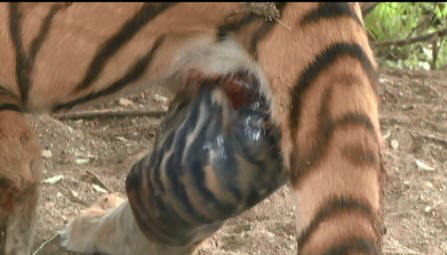 With the arrival of Panna’s cubs, a third type of tiger has arrived at Tiger Canyons. It is called a crossover tiger. This too is a natural phenomenon and should be conserved at all costs. A crossover tiger emerges when the white gene and the normal gene have fused together i.e. 30% of the white gene merges with 70% of the of the normal gene or vice versa. Therefore, one of Panna’s cubs has white hindquarter and a normal body. Perhaps 40% of the body is white and 60% is normal. Evolution works in strange ways. Sometimes it takes millions of years to evolve and sometimes in leaps and bounds. Could it be that we are witnessing evolution at work at Tiger Canyons right now? The habitat at Tiger Canyons for most of the year is brown, grey and yellow. The crossover cub blends into its surroundings better than the dark cubs who are more successful in a green forest of dappled light. The lion that blends so perfectly with the brown grass of the Savannahs was once a spotted cat. Could it be that a series of crossover genes changed it into a tawny cat to suit its background? Once again, the shy retiring forgotten Tigress Panna, has brought to the fore some crucial knowledge in the understanding of the evolution of the Tiger. I would like to thank Doug Fitzgerald for his in depth research and enlightening me on the genetic evolution of the Tiger. Doug’s research will prove valuable in managing the tiger going forward. The golden tabby and the black tiger possess flatfan genes. These are induced mutation genes which have come about as a result of inbreeding. These have no conservation value and should be avoided. Therefore, Tiger Canyons policy will be to protect and conserve the normal gene tiger, the white gene tiger and the crossover tigers. Many people have asked me why I don’t afford Tibo special protection. They point out that Tibo could be killed in a fight tomorrow. This is true, however at Tiger Canyons we are striving for a wild self-sustaining population of tigers. Therefore, if you are white, normal or crossover you will be afforded no special privileges. Each tiger must survive in the harsh world of tiger existence. Darwin’s law of natural selection and the strongest will survive, is very much applicable to the Tiger Canyon's Experiment. Hello to everyone at Tiger Canyons, I want to take this opportunity to say that I was very sad to hear that Joan Root was I believe murdered at her Kenyan home and that Alan Root died last month. However it makes me feel very angry to know that well meaning people who did so much to research conserve protect and film and bring their film work into our living room through the spectacular wildlife documentaries, have been murdered at their homes. I refer to people like George, Joy and Terry Adamson, Diane Fossey, and now the late Joan Root. I had and still have the greatest respect to those people, they didn't deserve to die at the hands of poachers or staff members. Please please if it is at all possible, can you convey my deepest sympathy to the family of Joan and Alan Root and also the field management team who have carried on with the research and protection of the gorillas from Diane Fossey. Thank you so much it will mean a lot to me if you can. May God Bless and Protect all who strive to save the worlds wildlife. Good luck to everyone at Tiger Canyons. Please convey my very best wishes to JV and two families both human and the big cats.